How was your weekend? Hope you had a lovely weekend and hope it wasn't too tiring? Last week was quite interesting for me actually as my character in Christ was tested immensely due to how someone related with me. 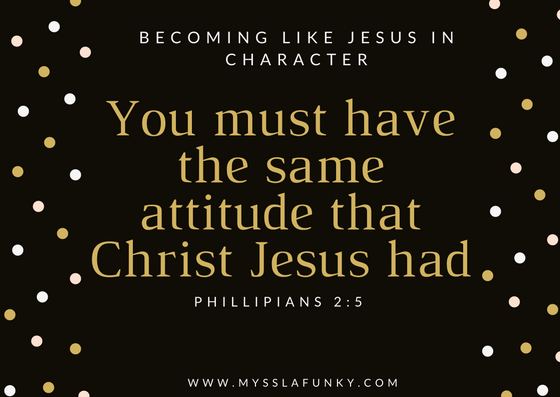 As you read this excerpt of a sermon by my husband, I'd like you to take time to reflect on your character and honestly ask yourself, is it really like Christ's character? If it is not, this is an opportunity to become like Jesus Christ in character and also to ask the Holy Spirit to help you. It is to be noted that my husband and I are still becoming like Jesus Christ in character. We do not want you to think that we are perfect but we are on a journey to perfection. We know that there had been times that we fell short and there had also been times that we knew that God was pleased with our characters. 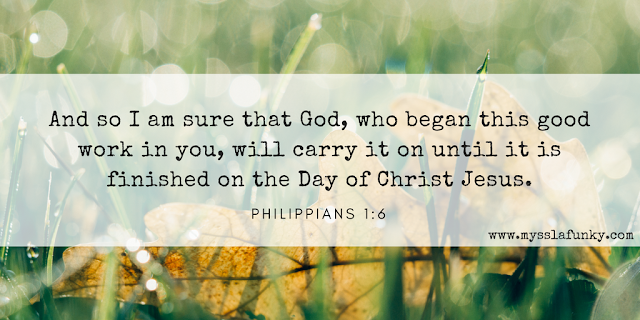 We would not want to dwell on past achievements but rather, we want to focus on where we are now and where God is taking us. When you reflect something, you are exhibiting its likeness. You are displaying its characteristics. Like a mirror, the Bible tells us that we should reflect the character and likeness of Jesus Christ. 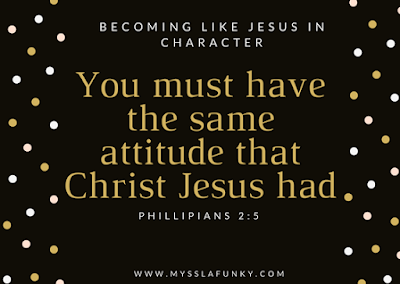 We should have the same attitude as Jesus Christ. See Philippians 2:5-8. 1) Prayer: Matthew 26:36-41 Jesus prayed in Gethsemane and told the disciples to watch and pray so they will not enter into temptation. Not just any kind of prayer, there was emphasis on aligning our prayers in line with God's purpose and plan for us. Therefore, it is good to pray for the will of God. Matthew 23:14. Christ could have prayed that the cup of crucifixion be taken away from Him, but He didn't. He could have prayed that the day of crucifixion be moved further but He didn't instead He prayed for God's will to be done. The book of John chapter 17 tells us about staying connected to the source of our power. Jesus prayed as many times as He could; Jesus never wanted to be separated from His father so He prayed at all times to maintain that channel of communication. Not just willing to pray but putting aside all busy schedules and praying. 2) Humility: The bible says that Jesus Christ humbled Himself and became obedient even to the point of death. Sometimes, when we pray and ask God to help us develop the spirit of patience that's when people come specially to provoke you just to test how much that patience is worth to you. Our human nature does not want us to be humble. Jesus washed the disciples feet with love thereby teaching us humility to even those we have authority over. In Mathew 17:24-28, Jesus humbled Himself to the authority that was in Government and He did not wield His power around aimlessly just to prove that He was the son of God. Instead He commanded Peter to go fishing and for him to bring the money he finds in the mouth of the fish to pay tax. The book of Romans 13:1-2 reminds us that all leaders and people in the authorities that exists are placed by God for a purpose, therefore we should obey them by doing our bit. 3) The Way Jesus Spoke: The bible describes the tongue as a powerful tool though small but directs life. See the book of James 3:5, Proverbs 18:21. Therefore Jesus Christ spoke positive words to the people. Mathew 9:23-26 made us to understand that when Jesus Christ said the girl is not dead but asleep the people ridiculed Jesus but this did not deter him from waking the girl up. "Always give thoughts to your words before they are spoken because your word is life and once spoken, it is difficult to reverse" - Mysses Lafunky's husband. 4) Forgiveness: Mathew 18:21-22 states that Jesus Christ commands us to forgive our neighbours up to 70 x 7. Forgiveness is not for the other person alone because if we don't forgive then we are also at the risk of not being forgiven. Do you have any recent experience that you did not reflect the characters of Jesus Christ? A) What happened? B) How did you handle it? C) And how would you handle, if a similar incident was to occur in the future? Merciful Lord, help me to become more like You. May I live a life that is more like You always. Lord Jesus, even when my character is being tested, help me to react like the way you will react in Jesus name. Merciful Lord, please forgive me for different ways that I had displayed characters (both in the open and secret) that did not reflect who you are. Have a lovely week! Remember to interact with us by answering our "Let's Talk" questions. New week alert! New post alert! Always so excited when it’s time to write a new post, if only I could be writing new posts daily 😢. Oh well, wishes and Lamborghinis. Are you a fan of war movies? Especially those ones that depict battle scenes from the period of the Roman or Greek empires? When the warriors get ready for battle, you see them getting their armours ready. What constitutes their armour? 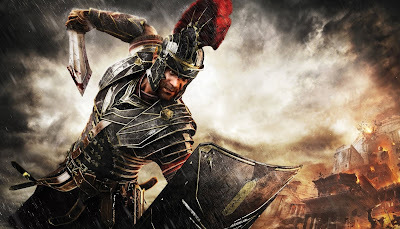 You have the shield, the breastplate (because mans ain’t tryna be sliced pork chop), the helmet (because mans can’t be walking around with a headless body), the belt, the sandals and of course the sword or hammer (depending on the warrior’s preference). Before battle, you see their armours shining and gleaming under the sun but by the end of the battle, it’s bloodied. But therein lies the difference between us and these warriors! Wait, what?! I am not understanding this! God, are you trying to tell me that after going through my Avengers assemble routine of suiting up to face Killmonger, I should just stand? Wow… amaziiiiing. Well, therein lies the difference, we are not expected to fight the battle (II Chr. 20:17). Why? For we wrestle not against flesh and blood (Eph. 6:12) and of course, there is no way you can physically fight what isn’t physical. Have you ever tried fighting a temptation with boxing or wrestling? That would be weird and impossible 😂. With that in mind, when God gave us the charge to suit up and stand, it was because He knew that there was no way we could fight the spiritual forces of this world with earthly armour or earthly battle strategies. You may say, but not all things we face in life are spiritual and I would say, all things are spiritual (I Cor. 2:15). Every situation you face in life, every battle, has a spiritual force behind it and that is why in Eph. 6, the bible takes the time to explain to us what we truly contend with when we see things happening to us in the physical and thereafter, tells us what to do about those situations (wear the armour of God, so we can stand our ground). As we go into this week, the charge is for us to wear the armour of God and stand. What is the armour of God? Eph. 6:14-17 gives us the details on what it consists, check it out. - Tell us, what situations in life have you faced and were unable to stand? - Why were you unable to stand? Trace your way back to God and suit up in His armour and ask for strength to stand when the evil day comes.